So here are some pictures from the Elijah Fields Twitter page that somehow are still available for public view even after his dismissal from Pitt this week. I'm going to go out on a limb and guess that the school wasn't exactly thrilled with these, whatever the context. For more on Fields' dismissal from the team, please read the recap here. And here's a handy guide to more Pittsburgh athlete Twitter accounts. "Dopeman, Dopeman, can I get another hit?" Maybe Fields stays in Tony Dorsett's old dorm room and found that in the mattress? Idiot. Not just for the repercussions with Pitt of posting such pictures, but also because telling the world you have multiple grand in your dorm room is a great way to get robbed. What a moron....got what he deserved. I love the grammar usage, or misusage, rather. "Football" probably should be a proper noun. Whatever the reasons? 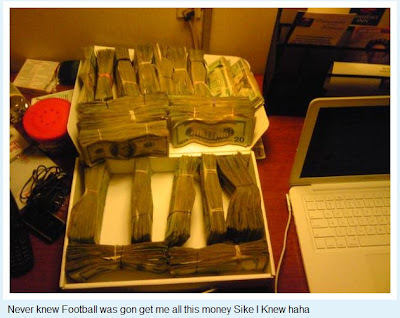 Lets see: Dismissed from college after bragging about getting loads of money from a college... I wonder why.